It’s sometimes said that gaming’s gift is to let us truly embody a role, allowing us to step into the body and look through the eyes of another. It’s what many refer to as the quality of ‘immersion’, and what I like to call ‘Empathy 2000’. It’s a special game, though, that holds out on that easy win – pulling back to grant a holistic view of its world, giving us a chance to shape it, so that when that moment of inhabitation comes it’s all the sweeter. Think of Jurassic World Evolution, played for the most part as a top-down management game in which you place the power stations and link the cables to the fast food restaurants and electric fences that keep the park’s operation going. Yet its finest moments come when, in frustration and panic, you take control of an asset containment chopper in third-person – barging aside the AI to chase after the T-Rex running rampant along pathways you placed, firing tranquilisers into the beast’s flank between the arches of a monorail you engineered. Rainbow Six once traded on this satisfying level of removal, too. Long before Ash and Thermite – even before thingummy and whatshisname in Rainbow Six Vegas – you played not as a hero glued to a riot shield, but simply whichever squaddie you happened to pick as leader that mission. The joy of being on the battlefield wasn’t in leaping in to save the day, but to see the meticulous plans you’d laid play out up close. Genesis Alpha One – which, as far as I can tell, translates as ‘111’, the UK helpline for non-emergency health issues – comes from this mixed-perspective tradition. As a premise it’s golden: a roguelike in which you assemble your spaceship during flight, clipping new modules onto its edges in build mode, before stepping into the one-size-only shoes of a clone to crew the vessel. 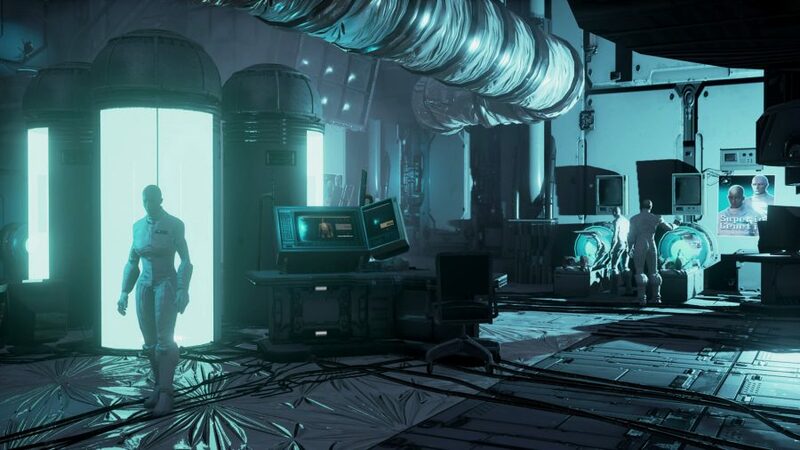 As with Rainbow Six, the clone you promote to leader is inherently no more important than any other – should you die on the dour surface of a nearby planet, protocol will dictate that another clone be promoted to take their place, and you’ll take control of them. Can I remember the name of the body I inhabited before my current one? No. His hands clack across the keyboards of the ship’s terminals just as quickly, so it doesn’t seem especially important. 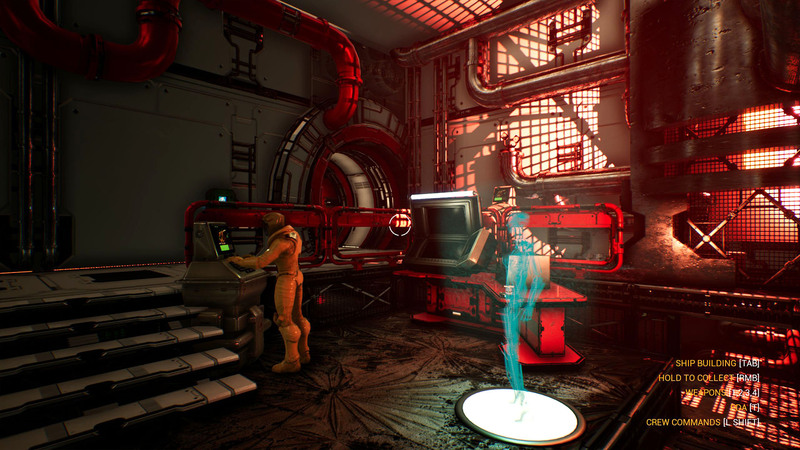 It’s not just an appreciation for ‘70s space furniture that Genesis Alpha One shares with Alien Isolation. When aliens get aboard your ship, you’ll discover that your rifle has a glowing directional indicator, and makes ‘pip, pip’ noises. That’s right - the classic motion tracker is ready and present, adding a modicum of tension to ship cleanup. There’s an easy pride that comes with stepping across the hallway to the new Clone Lab that you built and funded yourself, pressing the right button on the terminal, and watching as the fluid drains out of the tank and a new human steps out onto silvery plastic sheeting. When raw materials harvested from the void are sent to the refinery for processing, they aren’t simply vanished from one menu to show up another – instead, a floating robot drifts into the deposit cupboard, picks up a brightly coloured chunk of lithium ore in its metal claw, and carries it across the station to the relevant room. 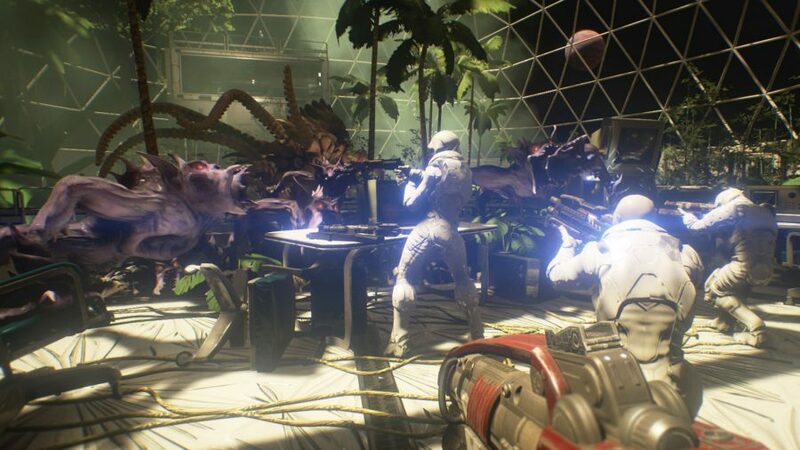 The thing is, the magnifying glass of first-person doesn’t do Genesis Alpha One any other favours. Planetary landings in particular suffer from apparent budgetary constraints – even a force shield, which prevents you from straying too far from the landing craft for fear of dangerous environmental conditions, can’t cover for the tiny scope of these drab landscapes. That robot with the claw? It clips straight through my crewmates. And an art style that shoots for the same ‘70s sci-fi that Alien Isolation and Headlander openly admired misjudges its calculations – winding up in orbit of hazy and indistinct instead. But it remains a marvel to see a chunk of space trash being sucked indoors, ready to be repurposed in your resource pile, simply because you happened to be passing through the tractor beam room at the right time. Genesis Alpha One’s commitment to showing its working lends the entire game a sense of tangible, tactile reality. I might be in space, fending off periodic attacks from stowaway insects straight out of Starship Troopers, but it’s actually happening. I can see it happening.